One of the arguments that I am developing in my current project is that once the Comintern ceases to function as a directing centre for the international Communist movement, individual Communist Parties start to look to several different places for guidance. 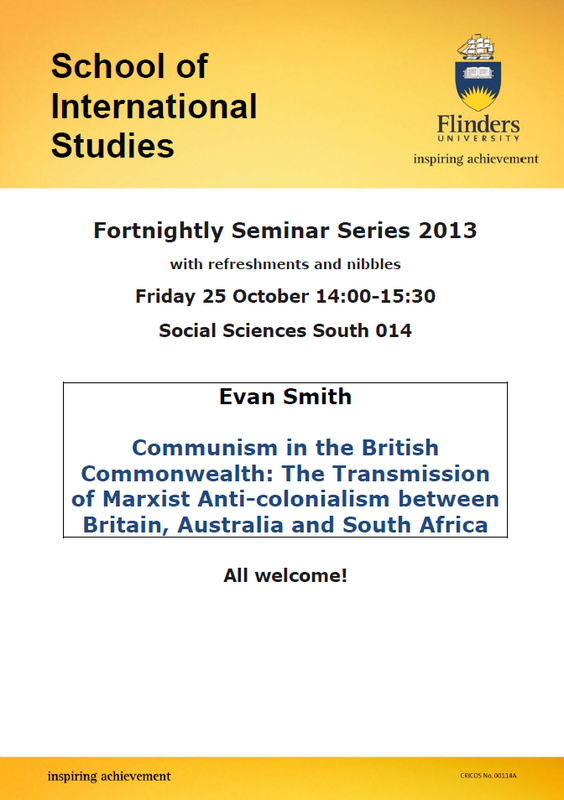 For the Communist Parties of the Commonwealth, London and Moscow existed as competing metropoles and as the Chinese Revolution neared victory, Beijing rose as a further alternative point of reference (it seems quite clear that the Soviet Union and China agreed on spheres of influence in late 1940s/early 1950s where Moscow would oversee things in Europe, while communists in Asia would follow the ‘Chinese path’). But the CPA was also highly influenced by the Chinese Communist Party at this stage and had close ties to the Communist Party of Malaya (based in Singapore), who were debating whether to launch an armed insurrection against the British colonial government. 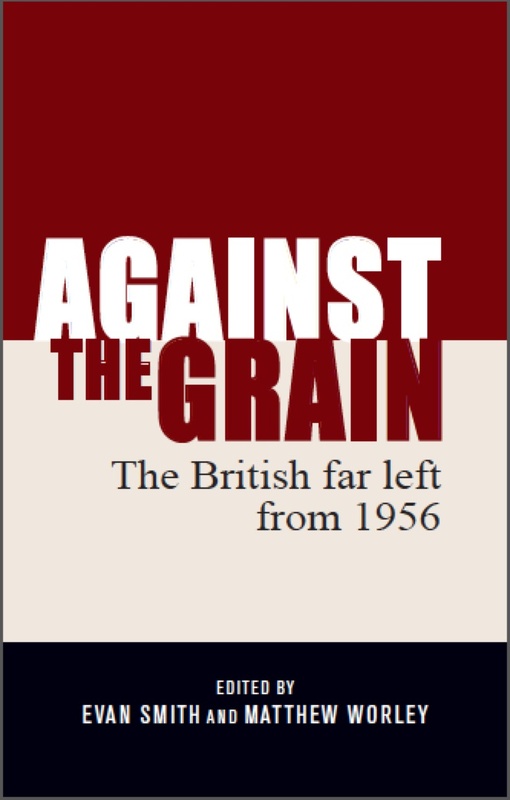 Part of the CPA’s critique of the CPGB was that as the British party supported the Labour Government under Clement Atlee, they were unwilling to fully support anti-colonial rebellions in the British Commonwealth as this would upset any prospective ‘Labour-Communist’ alliance. On the other hand, the CPA was very supportive of communist anti-colonialism in the South-East Asia region (on the doorstep of Australia). 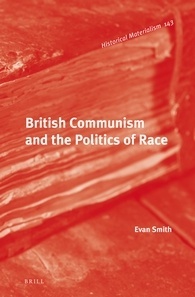 With its enthusiasm for the Malayan Communist Party, the CPA could highlight the contrast between its agenda and the ‘reformism’ of the CPGB and also depict itself as a supporter of the emerging anti-colonial movements in Asia. This leads to me this document, which I found in the CPGB archive in Manchester (CP/CENT/INT/34/02). 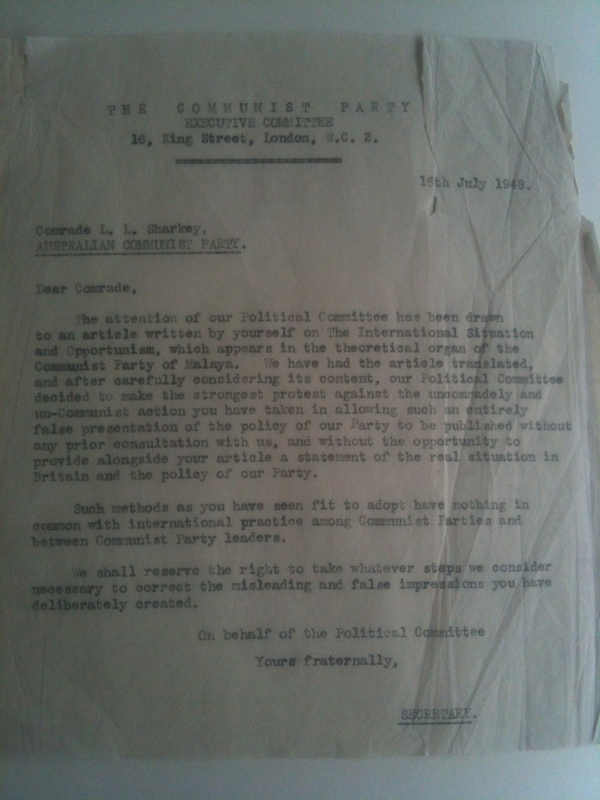 It is a letter from the CPGB’s Political Committee to L.L. Sharkey, the General Secretary of the CPA, for using the theoretical journal of the Malayan Communist Party to attack the CPGB. 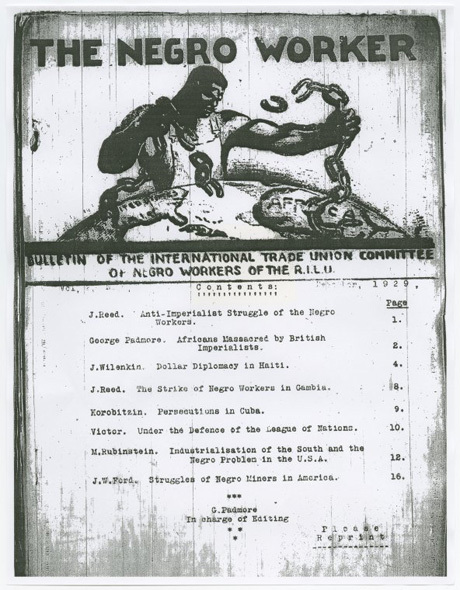 The CPGB described Sharkey’s article, titled ‘The International Situation and Opportunism’, as an ‘uncomradely and un-Communist action’ which allowed ‘an entirely false presentation of the policy of our Party’. This is a great letter to find in the archives, but it is only half (or a third) of the story. I had a look through the CPA archive at the Mitchell LIbrary in Sydney today, but couldn’t find anything from the CPA’s end. I also haven’t been able to ascertain the text of Sharkey’s article, particularly as the journal of the MCP remains unmentioned in the letter. I’m unsure whether the MCP has an archive to investigate either. I’d rather these videos went to a good home, so please let me know if you’re interested. Am willing to send worldwide. After Margaret Thatcher’s death in April this year, one of the debates that emerged was over whether Thatcher was a feminist and her role as a female political leader (for example, see this blogpost from Moonbat). In these debates, one quote was repeatedly referred to: ‘I owe nothing to women’s lib’. However I have spent most of the day trying to track down the source of this quote and it seems to be an invented quote (or at least a misquotation). Boy: Prime Minister, what do you think about Women’s Lib? P.M: I’m not very keen on it. P.M: No, because I think most of us got to our own position in life without Women’s Lib and we got here, not by saying ‘you’ve got to have more women doing so and so’ but saying ‘look, we’ve got the qualifications, why shouldn’t we have just as much a chance as a man?’ And you’ll find that so many male bastions were conquered that way, whereas Women’s Lib, I think, has been rather strident, concentrated on things which don’t really matter and, dare I say it, being rather unfeminine. Don’t you think that? What do the girls think, don’t you think Women’s Lib is sometimes like that? P.M: Do you like it? P.M: No, neither do I. Because, you see, you don’t need to cease to be feminine in order to do the job well, and anyway women have been in positions of authority in the past throughout history. 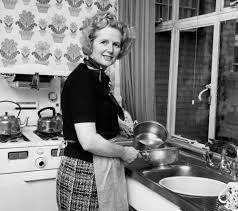 Thatcher: No, I’m not a feminist. Thatcher: Not too ultimate … . Nevill: How do you think you have helped women, and where do you think militant feminists have gone wrong? Thatcher: I think they’ve become too strident. I think they have done great damage to the cause of women by making us out to be something we are not. Each person is different. Each has their own talents and abilities, and these are the things you want to draw and bring out. You don’t say: “I must get on because I’m a woman, or that I must get on because I’m a man”. You should say that you should get on because you have the combination of talents which are right for the job. The moment you exaggerate the question, you defeat your case. The battle for women’s rights has been largely won. The days when they were demanded and discussed in strident tones should be gone for ever. And I hope they are. I hated those strident tones that you still hear from some Women’s Libbers’. The Battle is largely won, but we must now see women’s rights in perspective and turn our attention to how we could use human rights to build the kind of world we wish our children to in. From my quick scouring of the Thatcher Foundation website, these seem to be the most relevant quotes by Thatcher on feminism and women’s liberation, but I’d be keen to find some more. If anyone knows where the ‘I owe nothing to women’s lib’ is from, please let me know. Research query: Did the UK left wing press cover ‘alternative comedy’? I am currently turning my series of blog posts on The Young Ones and Thatcherism into a journal article and am trying to find an answer to the following question – did the left wing press in the UK (especially the CPGB’s Morning Star and Comment or the SWP’s Socialist Worker) feature any articles/reviews of ‘alternative comedy’ in the early-to-mid-1980s? While the British left did get enthusiastic about certain forms of popular youth culture during this period, I’m curious whether this extended to comedy. 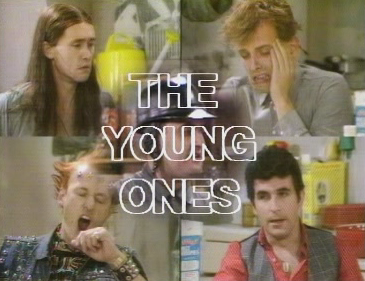 I’m particularly interested in finding out whether there were any reviews of The Young Ones when it was first aired. If anyone has access to left wing publications from this period and can check for me, or if you have memories of the left covering the alternative comedy scene, please let me know. I will be eternally grateful. I have recently come across this document on the Margaret Thatcher archive, which publishes relevant documents from the National Archives and from Thatcher’s personal papers, relating to the 1981 riots and the suspicion that ‘outside elements’ were involved in the disturbances. 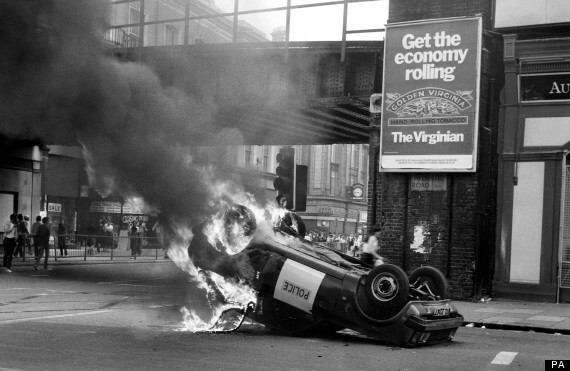 Peter Shipley, a researcher of the British far left and Conservative Party adviser, wrote a minute (titled ‘Left-Wing Extremists and the Riots’) outlining the role of the far left groups in the riots and their aftermath. 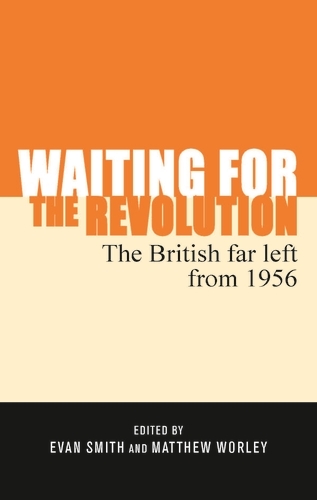 It is interesting as it reveals right-wing thinking about the far left at the time and overestimates the influence of the far left in some instances. Shipley argued that Trotskyist groups were concentrating their efforts in inner-city areas affected by the riots, like Brixton and Toxteth. Shipley identified the Militant Tendency as the most prominent, but what is interesting is that the other groups mentioned were some of the more obscure left-wing groups around. The Workers Revolutionary Party, the Revolutionary Communist Group and the Revolutionary Communist Party (precursor to Spiked! Online) were all identified as having a presence in Brixton at the time of the riots. The Socialist Workers Party was noted for its leafleting in Brixton and its role in the Anti-Nazi League in Southall, but it was interesting to see that Shipley did not include them in the list of far left parties with a presence in Brixton. It is also interesting to note that the Communist Party of Great Britain, the largest far left group, received no mention at all. 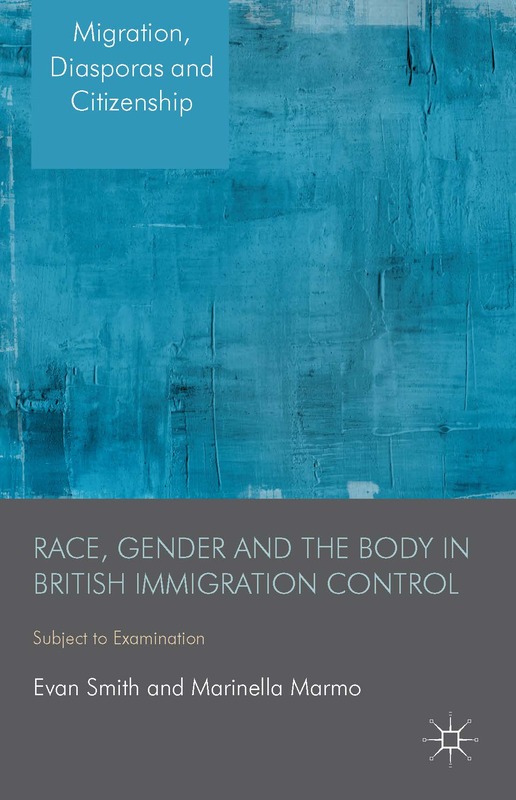 Shipley also makes dubious links between the riots that were occurring and the ‘trouble’ in Northern Ireland, stating: ‘I wonder what extent any organised element in the Toxteth riots might have been and inspired by the city’s Irish contingent. The balaclava masks were very remiscient of Northern Ireland’. Parts of this document formed part of a wider document created by the Prime Minister’s department, ‘Extremists and the Disorder’, which can be found in this digitised file from the National Archives. It is interesting to see how much Thatcher overestimated the far left and its pressure groups in the early 1980s.